one for a member from the adult sector, won by Lesley Cioccarelli. Jennifer and Lesley presented at the professional learning session on Saturday 30 July, and here is the first of the reports. Firstly, thank you to ATESOL ACT for the competition for registration sponsorship for the ACTA-ACAL 2016 Conference. These are my highlights from the conference – I’m not trying to cover everything I attended. 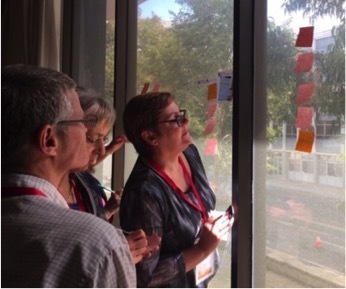 I seem to have picked workshops as my highlights, but I think that is because that is where I was able to share and learn alongside colleagues from around Australia. The papers and keynotes were also very useful for reflecting on the state of TESOL and my own practice. I love conferences for the opportunity to network and share with colleagues, but what do you do for the other 363 days of the year? Answering this was the theme of the workshop I presented with Fairfield Primary School teacher, Cindy Valdez-Adams, the powerhouse behind #tesoloz on Twitter. I’ve done quite a few of these, but not with a teacher from the school sector before, so it was a new experience for me. 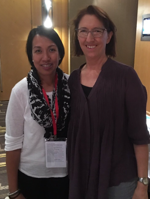 Cindy and I met for the first time in Perth at the Conference, but we had been collaborating on the workshop online for months. Cindy and I are passionate about connecting, sharing and learning via social media and wanted to help others learn how to join in. After a group discussion activity about ‘why’ teachers might want to connect online, we shared our own stories about our social media journey. We then covered the ‘what’ and ‘where’, introducing participants to the some of the online communities we engage with on Facebook and Twitter. Then we took everyone through the ‘how’ in an activity on learning to tweet using sticky notes – see photo. We encourage all teachers in the adult sector to join the conversation! I found many ideas from this workshop to take back to my work at CIT, in our Student Support team, including additional ways we can encourage implementation of Universal Design of Learning (UDL) in all areas. This workshop was a flurry of engaging and useful activities. Naomi Migliacci is President of NM Consulting, an international firm that “promotes rigorous, active learning for teachers and their students”. 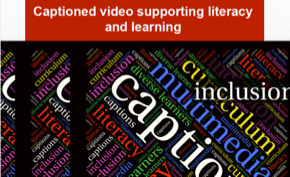 How do we engage diverse populations of students with limited English and limited educational backgrounds in language and literacy learning experiences and increase academic achievement for their 21st century futures? And covered challenges for teachers and using Problem-based Learning with EALs. 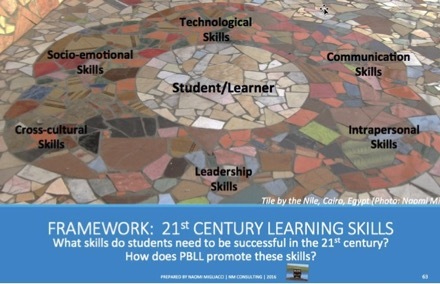 And finished with this question for discussion: How does PBLL promote 21st Century Learning Skills? Naomi delivered a similar workshop at the ACTA 2014 Conference, and you can access her presentation slides here: Meeting the ELT Challenge in the 21st Century: Problem-based Learning (until the 2016 slides are available, then I’ll link to those). This was another very interactive workshop, where we were working the whole time on simple practical activities which were immediately useful in our own teaching practice. Geoff Pearson has been an ESL and literacy teacher for more than 35 years, focussing primarily on workplace programs in WA. 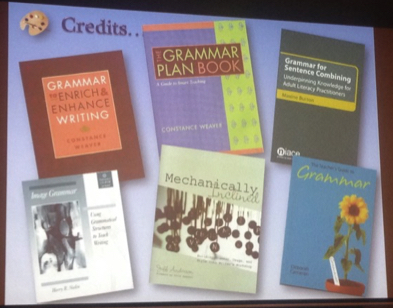 He also delivers a very popular ’Teach Me Grammar’ Action Learning Program in Perth. Geoff started off by saying that the session was for adult literacy teachers, but I personally found it very useful as an adult ESOL teacher. Our first activity was to construct a poem, and Geoff recounted how a group of ‘at risk’ students wrote their own poems and found they “liked the sound of their own writing”. What makes a sentence a sentence? Then ask… Is it a sentence? Context needs to make sense to the learner. Putting things in a context doesn’t help if it doesn’t make sense to the student. The importance of personal references, eg, my arm is one metre long. Intriduced us to examples of activities that they have successfully used with very low-level learners (ACSF Pre-level 1). Do you know Australia’s joint history? And can you teach it? Each of us has a responsibility to know it and teach it. The dominant model has failed many people classified as ‘illiterate’ for their failure to acquire it. Is adult literacy something to achieve our goals or is it something worthwhile in its own sake? How realistic is it to expect learners of refugee backgrounds to cope/thrive(?) in a high challenge environment? online – join a community! Thank you, Lesley. 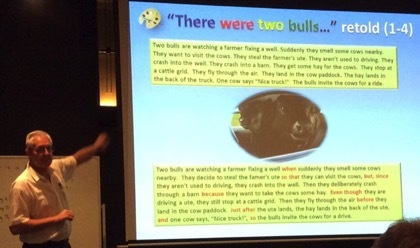 Would love to invite Geoff Pearson to do a grammar presentation. Sounds really good.